The latter is apparently becoming a problem. Bars and taverns alone are expected to bring in $19.8 billion dollars in 2017, a 2.5 percent increase from the $19.3 billion they earned in 2016, the National Restaurant Association reports. Booze delivery service Drizly said it had an an 86 percent increase in orders the night of the 2016 election compared to a typical Tuesday, and other alcohol delivery apps saw the same trend. Problematic drinking, which researchers say means drinking to the point of disrupting your life, increased by nearly 50 percent between 2002 and 2013. 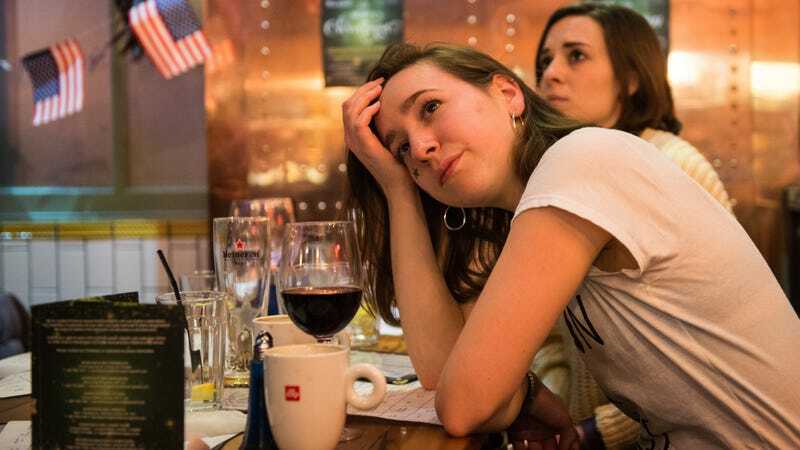 Even before the ultra-stressful campaign and election, our drinking habits were heading in a scary direction, according to a study published in JAMA Psychiatry, which notes that women and minorities are turning to the bottle for comfort. Hmm, I wonder why. “Holding everything else constant, our findings suggest that when a state becomes more liberal politically, its population consumes more beer and spirits per capita, but possibly less wine per capita,” researchers said. While it’s hard to get solid data on how much drinking habits have changed from 2015 to 2017, the anecdotes in the Munchies piece ring true here in progressive Chicago. Whether it’s drinking more to cope with infuriating family conversations or seeking comfort in like-minded friends over beers—we might want to switch to a mocktail once in awhile. Ask The Salty Waitress: Would you ever sleep with a regular?